These red, white, and blue practice barrels are just like the real thing. Each is one is 23 ½” in diameter and 34” tall. 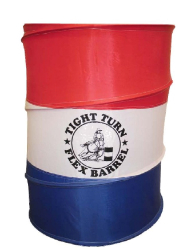 All of the barrels are imprinted with the “Tight Turn” logo. All three fit conveniently inside a zippered carry bag. Each barrel has a slightly weighted base and the top has a drawstring closure. Each set contains 3 barrels and a carry case.